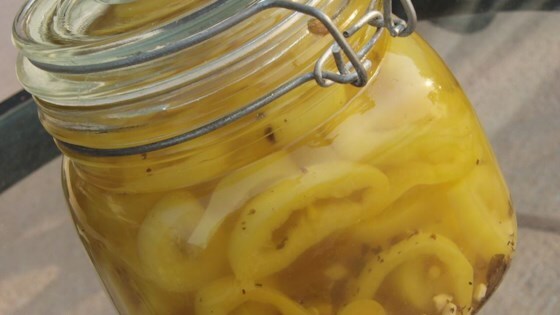 "These pickled peppers are great in salads or to serve alongside a meat dish. These can be made less spicy by removing the seeds from the peppers." Place the banana peppers, jalapeno peppers, and serrano peppers into a large pot. Add the vinegar, water, garlic, and onion. Bring to a boil, then reduce heat to medium-low, and simmer for 5 minutes. Ladle peppers into sterile jars, and fill to the top with the liquid, leaving 1/4 inch headspace. Tap jars on the counter to remove air bubbles. Place two piece lids on the jars. Simmering for five minutes turned the peppers to mush. I tried it a second time just adding boiled liquid to the jar full of peppers and it came out just right. Mine turned out mushy - not the right texture for pickled peppers. Any suggestions? An excellent recipe for canning peppers from the garden. Easy and simple ingredients for anyone who can. We are very happy with the flavor and ease of this recipe! This was very easy and simple. As one of the others stated that soon after the taste is OK but when you let them "age" they are excellent. I added a little olive oil and basil for extra flavor. Awesome recipe!